Sleepytime. Bathtime. Anytime. 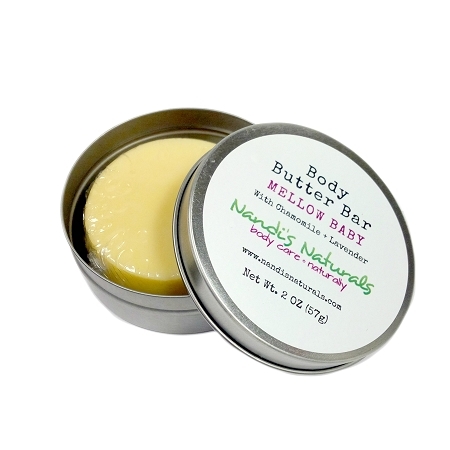 Mellow Baby Body Butter Bars are specially formulated for baby’s sensitive skin. As effective and protective as our Mellow Baby Lotion Stick but in a larger, easy-to-grasp size, this creamy bar containing organic chamomile extract and lavender essential oil helps keep baby’s skin soft and moisturized. It’s also perfect for soothing and protecting dry skin patches. Make this softly scented bar a part of your baby’s daily routine. Nandi’s Naturals body bars come in handy, decorative tins that can be slipped into baby’s diaper bag or placed right next to the bathroom sink or changing table. Our Mellow Baby and Original (Unscented) body butter bars are the bee’s knees for use on babies. 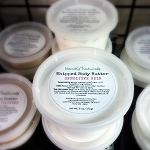 Did you know that you can also order body butter bar refills? Do your part to cut down on industrial emissions, while saving money on your next bar. Refills come shrink-wrapped without the tin. Choose "refill" from the Base & Refill Selection menu above. Since no water is added to this product, it needs no preservatives. Our creamy, long-lasting body bars are infused in a beeswax base. The lightly scented bars melt on contact and are quickly absorbed into the skin. Grasp bar into palm of hand. Lightly glide over baby’s skin, and then massage the lusciousness deep into the skin until absorbed. Caution: THIS IS NOT SOAP! Keep out of direct heat and sunlight to prevent melting.